Saying goodbye to my favorite fella felt like my heart was being ripped out. Smitty! Don’t forget me – I’ll see you soon! Smitty leaving the house in RI. What? You didn’t think I was talking about a human, did you? I bought Smitty (my 2003 Harley Davidson 1200 Custom Sportster) in August 2003. That’s how long we’ve been together. I experienced my first motorcycle ride when I was 6 or 7. My best friend’s father took me around the block, and I was hooked. When I was a teenager, I sought motorcyclists to befriend. In 1990-ish with then-boyfriend at the Canadian border. We were detained on our way back into the States! It took an embarrassingly long time for me to realize that I could get my own motorcycle and stop relying on others to go for a ride. The biggest obstacle to buying my own motorcycle was my mother. I can’t say I blame her… I’d been in 10 car accidents – one severe enough to land me in the hospital for two weeks. 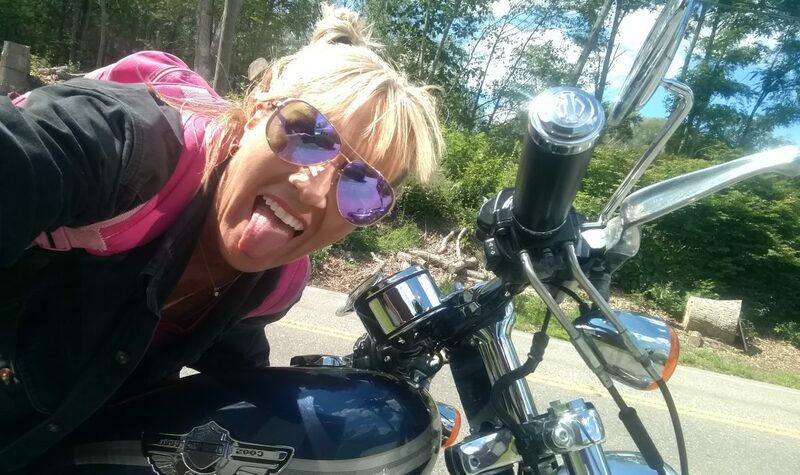 My brilliant idea: Take Mom motorcycle shopping and have her pick it out. You may think that was crazy, but my mother had a knack for choosing good vehicles. Plus, she was the best negotiator I’d ever seen firsthand. So here I was, 32 years old – a homeowner – taking Mom and Dad with me to pick out my motorcycle. She chose Smitty. I chose his name. She negotiated an unheard-of $4,000 off the asking price. And, you know what? It worked. Mom doesn’t worry as much about me riding. My friend Bonnie in Bluffton, SC, letting me know Smitty arrived safely! When I’m sad, stressed, or generally feeling unsettled, Smitty and I hit the road. No one has ever made me feel as good. His magical healing power is the reason I decided to move South – so we could spend more quality time together. If you ride, you get that. So remember when you hit the road in the warmer weather: Please pay attention to the road. My fellow riders and I are out there trying to shake off the blues, or de-stress.